What's MTBoS? It's all math teachers who blog and/or tweet! It could be YOU! Welcome to the MTBoS: Find profiles of teachers, work they have created online, reasons why you should participate! 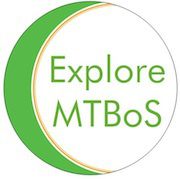 Exploring the MTBoS: For the past few years the MTBoS has tried to reach out to as many math teachers as possible by creating prompts, activities, fun missions to help teachers connect. MTBoS Search Engine: Need an idea for how to teach a hard-to-teach concept? Google returns thousands of hits but few are what you need? Search just math blogs ... it's the best! MTBoS Directory: Looking for a colleague, someone who shares your passion and possibly teaches a similar curriculum? Check out the directory! Add yourself! MTBoS LiveBinder: Many, many links to pursue! #MTBoS: Hashtag for Twitter ... a way to connect, find ideas, ask for answers! Learning ... Videos & Docs: for your own learning or for preparing professional development!